MINI Cooper Acccessories + MINI Cooper Parts :: OutMotoring.com MINI Blog :: MINI Accessories :: See and now hear with your side mirrors! See and now hear with your side mirrors! 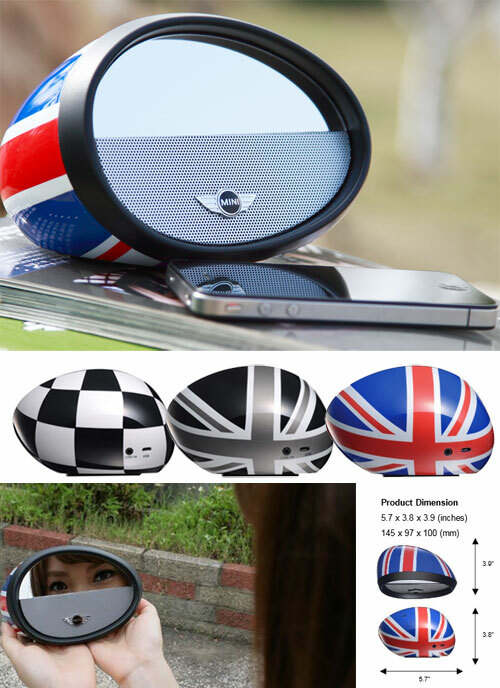 Synopsis: Side mirror Bluetooth speakers are available in a variety of sizes and patterns! This high-performance Bluetooth stereo speaker and speakerphone offers outstanding audio quality and ultra cool design. How can you NOT love the shape of this speaker? The speaker is equipped with NFC for easy-pairing (touch to pair), aptX and AAC for playing high quality sound. Its internal battery also enables the speaker to play music for up to 8 hours. Perfect for the desktop, office, end table, living room, bedroom or kitchen. It will draw attention no matter where it's placed. MIRROR Boombox with its half-mirror design also has hidden “behind the mirror” controls that appear and disappear as you touch the control button keys. Available in Checkered Flag, Union Jack or Black Jack to fit your style. Comments on See and now hear with your side mirrors!